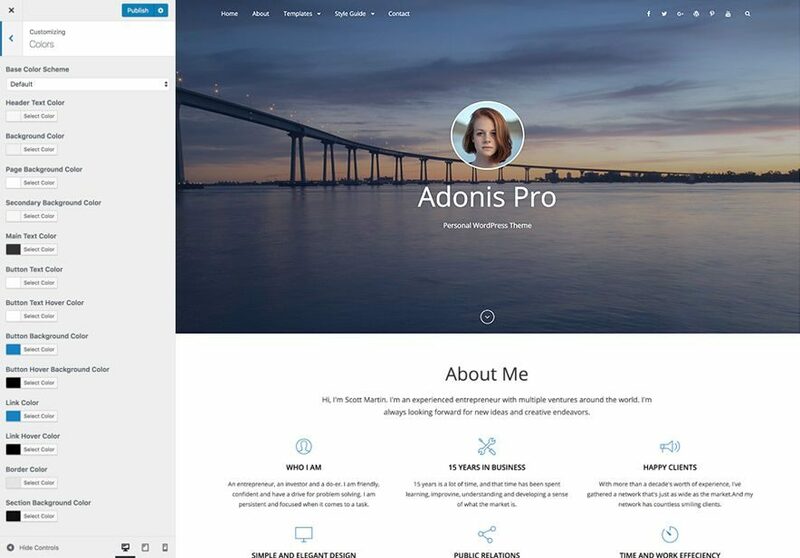 Adonis Pro is simple, clean and super user-friendly Personal WordPress theme for professionals that will always put everything you have to offer in the forefront. The theme has been crafted in a way, through which, the world will effortlessly know about you and your work. 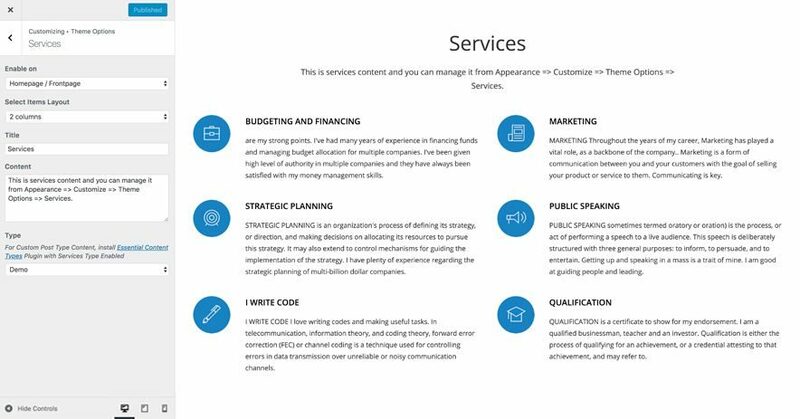 It mainly focuses on creating an elegant personal website for the professionals in only a matter of times. 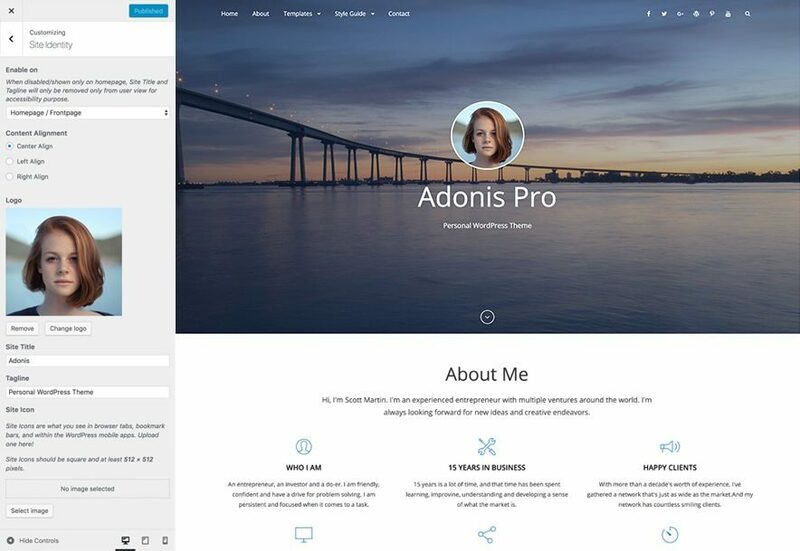 Adonis Pro comes with an array of amazing features — such as, site identity, header media, header image, background image, custom menu, breadcrumb, excerpt, featured content, featured slider, logo slider, hero content, layout options, pagination options, portfolio, testimonials, services, testimonials, contact info, stats, color options, family options, and many more — that are extremely crucial for any professional to flaunt their work. 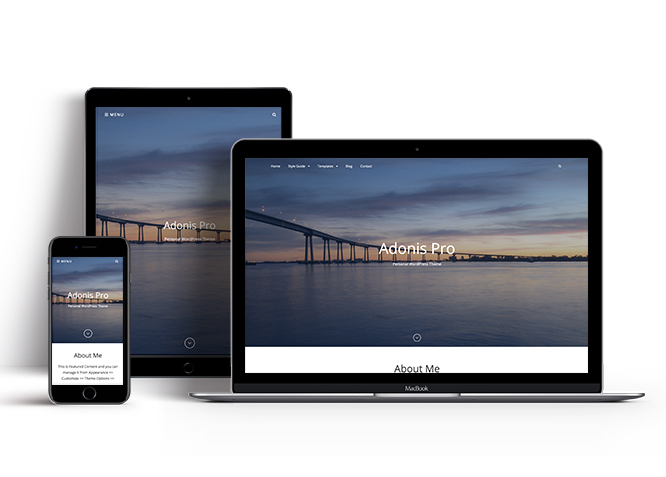 The new minimalistic responsive WordPress theme for Professionals, Adonis Pro is a colorful, fresh, youthful and energetic WordPress theme that gives a polished and professional feel. The theme is translation-ready as well. 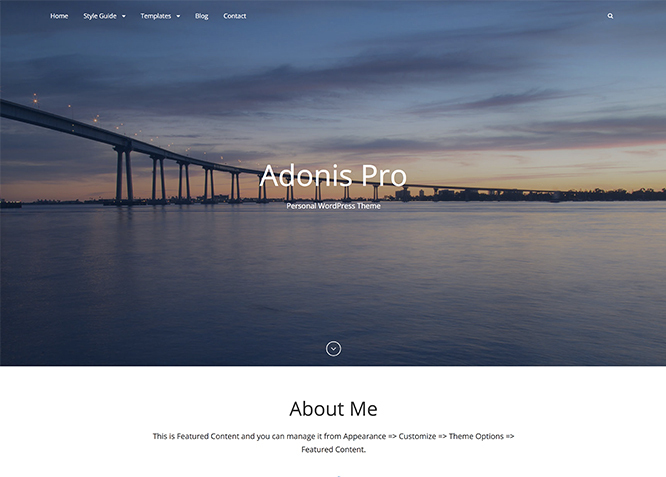 So, keep your blog varied, entertaining, and let the world know about you with Adonis Pro! For more details, check out Theme Instructions. Go to "Appearance => Themes => Add New"
If you have just changed your theme then you need to regenerate image thumbnail for post published before activating this theme. You can simply install Regenerate Thumbnails Plugin. Then Regenerate Thumbnails through "Tools => Regen. 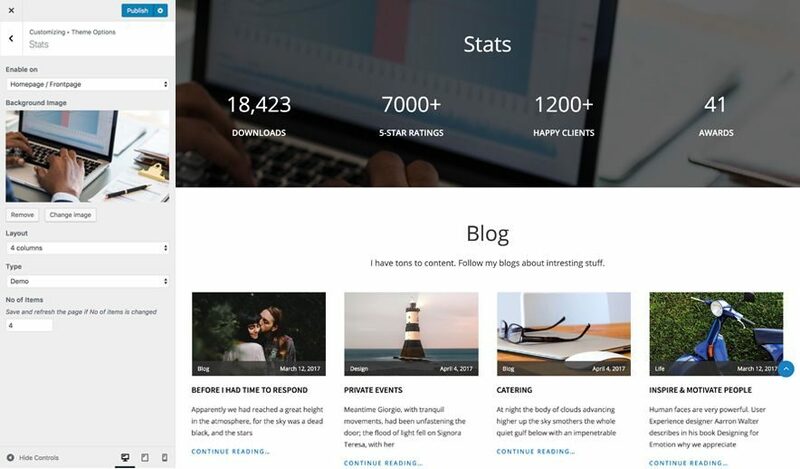 Thumbnails" in your WordPress Dashboard. 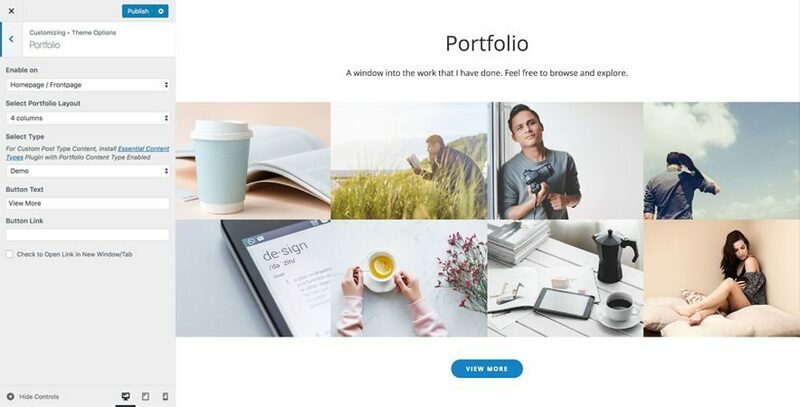 Go to "Appearance => Customize => Site Identity"
You can replace the default logo by clicking on it, or click on "Add new Image"
Go to "Appearance => Customize => Site Identity => Site Icon"
Go to "Appearance => Customize => Colors"
Custom Header Image is different from site logo. It's a large global image in the header to obtain a much more personalized look and feel. To add header image, you need to go to “Appearance => Customize => Header Media =>Header Image”. Here, you can add/change/hide Header Image, select option to Enable Featured Header Image on, Size and add in links and alt tag as per your website need. When you are in "Appearance => Customize => Header Media => Header Image", you will see option "Enable Featured Header Image on". There are 7 options, which gives you flexibility to add Header Image as per your website need. 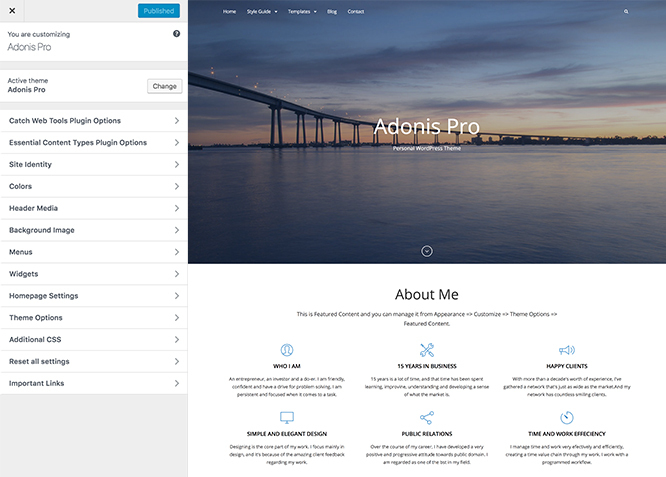 Go to "Appearance => Customize => Header Image"
Now, select enable options in "Enable Featured Header Image on"
Adonis Pro support Post, Page, Image and Category as logo slider. Go to "Appearance => Customize => Theme Options => Logo Slider"
Enable logo slider under option "Enable on"
Adonis Pro offers exciting Menu Options! This theme supports and recommends using "Custom Menus". You can create Custom Menu through "Appearance => Menus" from your WordPress Dashboard. Select Menu Locations You can assign your custom menu in 2 different locations. You assign it either from "Appearance => Customize => Navigation" or from "Appearance => Menus => Manage Locations" Select your Custom Menu as Primary Menu to display it as the Main Menu, which will replace the default Page Menu Select your custom menu as Social MenuNote: If you do not see Navigation Option in "Appearance => Customize", it will mean you have not created any menu. Go to "Appearance => Menus" to create menu first. Go to "Appearance => Customize => Theme Options => Breadcrumb Options"
To enable Breadcrumb on Homepage, check option "Check to enable Breadcrumb on Homepage"
To change the separator between Breadcrumbs, use desired separator below "Separator between Breadcrumbs"
Go to "Appearance => Customize => Theme Options => Comment Options"
To disable note below comments box, check option "Check to Disable Notes"
To disable website field, check option "Check to Disable Website Field"
Adonis Pro supports 4 contact types they are: 1. Post, 2. Page and 3. Custom. For Contact Info, go to "Appearance => Customize => Theme Options => Contact Info". To enable Contact Info, select "Homepage/Frontpage or Entire Site" option under "Enable on"
Go to "Appearance => Customize => Theme Options => Excerpt Options"
Adonis Pro supports 5 services types they are: 1. Post, 2. Page, 3. Category, 4. Image and 5. Custom Post Types. For Services, go to "Appearance => Customize => Services". To enable services, select "Homepage/Frontpage or Entire Site" option under "Enable on"
Under "Type", you need to select "Post"
Note: When you select post, make sure your Post have Featured Image. Click here to watch our Video Screencast to add Featured Image. Under "Type", you need to select "Page"
Note: When you select page, make sure your Page have Featured Image. Click here to watch our Video Screencast to add Featured Image. Under "Type", you need to select "Category"
Note: When you select categories, make sure your Posts in those categories have Featured Image Click here to watch our Video Screencast to add Featured Image. Under "Type", you need to select "Image"
Under "Select Items Layout", you can select your desired layout from "1column",2 columns" or "3 columns" or "4 columns"
Adonis Pro supports 4 featured content types they are: 1. Post, 2. Page, 3. Category and 4. Image. For Featured Content, go to "Appearance => Customize => Featured Content". To enable featured content, select "Homepage/Frontpage or Entire Site" option under "Enable Featured Content on"
Under "Select Featured Content Layout", you can select your desired layout from "2 columns" or "3 columns" or "4 columns"
Check option, "Check to Move above Footer"
Then under "Display Content", you need to select "Show Excerpt", "Show Full Content" or "Hide Content"
To enable slider, select "Homepage/Frontpage or Entire Site" option under "Enable Slider on"
Under "Type", Select Slider Type as "Post, Page , Category or Image"
Under "Type", Select Slider Type as "Post"
Note: When you select post, make sure your post have Featured Image. Click here to watch our Video Screencast to add Featured Image.Note: Featured Post is determined according to Number of Slides. Under "Type", Select Slider Type as "Page"
Note: When you select page, make sure your page have Featured Image. Click here to watch our Video Screencast to add Featured Image.Note: Featured Page is determined according to Number of Slides. Under "Type", Select Slider Type as "Category"
Note: When you select categories, make sure your posts in those categories have Featured Image. Click here to watch our Video Screencast to add Featured Image. Under "Type", Select Slider Type as "Image"
Note: When you select page, make sure your page have Featured Image. Click here to watch our Video Screencast to add Featured Image.Note: Image Slider is determined according to Number of Slides. To change Transition Effect, select option under "Transition Effect"
Go to "Appearance => Customize => Theme Options => Font Family Options"
Go to "Appearance => Customize => Theme Options => Footer Editor Options"
To enable Hero Content, select option Entire Site or Homepage/Frontpage under "Enable Hero Content on"
Go to "Appearance => Customize => Theme Options => Homepage/Frontpage Options"
This is additional option on Adonis Pro. Then check option "Check to disable Recent posts/Content on homepage"
Adonis Pro has 2 Site Layout, 4 Default Layout, 4 Homgepage/Archive Layout, 4 Single Page/Post Layout, 4 Archive Content Layout, 4 Single Page/Post image layout and 4 Woocommerce Layout to choose from "Appearance => Customize => Theme Options => Layout Options"
Once you are in Layout Options, you can Check the box below "Default Layout Options" which will set our site layout. Further, you have the choice of selecting custom layout for individual pages and posts through "Adonis Options => Layout Options", which you shall find below individual posts and pages, when you click on them for adding/editing. Once you are in Layout Options, you can Check the box below "Single Page/Post Layout" which will set layout for single pages/posts. Once you are in Layout Options, you can Check the box below "Archive Content Layout" which will set our site archive layout. Once you are in Layout Options, you can Check the box below "Woocommerce Layout" which will set layout for WooCommerce pages. Go to "Appearance => Customize => Theme Options => Layout Options"
Go to "Appearance => Widgets"
Add Widgets to "WooCommerce Primary Sidebar"
To disable search box in header click option "Check to disable search box in Header"
Go to "Appearance => Customize => Theme Options => Pagination Options"
To enable Portfolio, select option Entire Site or Homepage/Frontpage under "Enable Portfolio on"
Under "Select Portfolio Layout", select portfolio layout as "1 column, 2 columns or 3 columns or 4 columns"
Under "Select Type", you need to select "Post Content"
Note: To edit Portfolio Archive Title, Acrhive Content and Archive Featured Image, go to Customize => Portfolio"
Go to "Appearance => Customize => Theme Options => Scrollup Options"
Check option "Check to disable Scroll Up"
Go to "Appearance => Customize => Theme Options => Search Options"
Change the text below "Display Default Text in Search"
Adonis Pro supports skills option to show case your skills in theme. 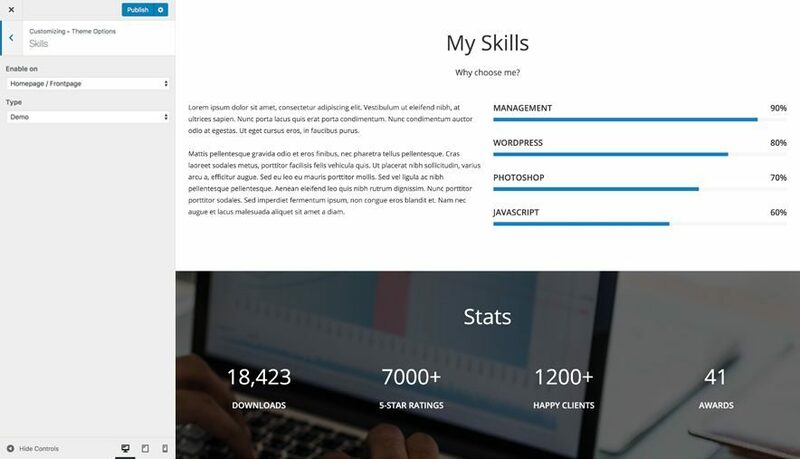 Go to "Appearance => Customize => Theme Options => Skills"
Adonis Pro supports Stats as Post,Page, Category and Image. Go to "Appearance => Customize => Theme Options => Stats"
Enable stats by click option under "Enable on"
Go to "Appearance => Customize => Theme Options => Testimonial"
Then under "Select Type" select "Post", "Jetpack Testimonial Custom Post Type", "Page", "Category" or "Image"
Then under "Select Testimonial Layout" select the desired columns you want to display in testimonial "1 column or 2 columns"
Under "Headline", you can add desired text or leave it empty if you don't want to disable fields"
Under "Sub-headline", you can add desired text or leave it empty if you don't want to disable fields"
Under "Select Type" select "Post"
Under "Select Type" select "Page"
Under "Select Type" select "Category"
Under "Select Type" select "Image"
Note: To move testimonial above footer check option "Check to Move above Footer" and to enable slider in courses check option "Check to Enable Slider"
Go to "Appearance => Customize => Theme Options => Update Notifier Options"
Check option "Check to disable update notifications"
Go to "Appearance => Customize => Theme Options => WooCommerce Options"
Adonis Pro supports CT: Social Icons. You can add widget in widget area as per your need. We have moved Webmaster Tools to our plugin Catch Web Tools for better management and data access. So, just install Catch Web Tools plugin and activate “Webmaster Tools” from Catch Web Tools plugin dashboard. You can verify your site on Google, Yahoo and Bing by adding in the IDs in the respective boxes through "Catch Web Tools => Webmaster Tools" in your WordPress Dashboard. Further, you can add in the Google Analytic. Adding scripts in Header and Footer does not require you to edit codes through Webmaster Tools. Basic SetupAdonis Pro is WPML-compatible, that means all the text in this theme can be translated to the language of your choice. To begin, be sure you have the WPML Plugin installed and activated, along with WPML String Translation plugin.For First Time SetupTo set up WPML for the first time, follow their Getting Started Guide. To begin translating, select WPML (in the Dashboard menu) -> String Translation. You should see a list of the strings in the theme, with blue translation links to the right. Click these links to reveal the list of languages you use on your blog and the associated translations. Go to this link for more details.